I arrived to work on Wednesday (April 22) to learn that we were going to be ready to open the North Cascades Highway at 8 p.m. on Friday, April 24, one week earlier than predicted. This caught me (and many others) by surprise because up until then I had only heard that we were aiming for a May 1 opening. This was exciting news and was going to make a lot of highway users very happy. Why were we able to open a week earlier than we thought? Because of the warm temperatures. Even though initially the warm temperatures were causing avalanches and making it very difficult and dangerous for our crews to clear the highway, it ended up helping us more than it hurt us. The warm weather moved (melted) far more snow in a very short amount time than we could have ever done with our snow blowers. Consequently, when the avalanche danger stabilized, we were able to blow through the remaining snow very quickly. Opening the highway on Friday, April 24 will make many anglers very happy because it's just in time for the opening weeking of fishing season. Plowing through the 37 miles of snow this year only took four weeks; two weeks less than last year. When the gates swing open, drivers should find the road conditions bare and dry or bare and wet across the entire route. The weather forecast calls for temperatures in the mid 40s, clouds and a freezing level around 4,500 feet. There is a possibility of some rain forecast Saturday through Monday. Over the last 10 years, the pass has reopened for traffic between March 10 and May 7. The latest opening was June 14, 1974. The reopening effort has taken from as little as two weeks to as many as eight weeks. The highway never closed during the drought winter of 1976-77. Updates and photos of the annual spring reopening are posted on the WSDOT SR 20 web page, www.wsdot.wa.gov/traffic/passes/northcascades. It makes sense that most of the projects we take on are about improving traffic or driver safety. And if you follow our news, you may also notice that when you hear about us doing something off of our highways or freeways, it’s usually to improve fish and wildlife habitat. Well, this weekend we’re celebrating the end of a project that’s about improving the environment for many of our human neighbors in Seattle. Residents living along I-5 in Seattle’s Green Lake and Licton Springs have experienced increasingly louder levels of noise coming from the freeway since it was built more than 40 years ago. Back then, standards for reducing noise in the neighborhoods were lower than they are today. And as the Seattle and the Puget Sound region have grown over the past decades, there are far more tires hitting the concrete than were ever expected. To improve the noise environment for residents of these neighborhoods, we designed and constructed three noise walls on the west side of I-5 between Fifth Avenue N.E. and N.E. 92nd Street. We developed a great working relationship with our neighbors throughout the planning, design and construction phases. After the Legislature funded the project, we first checked in with the neighbors by conducting a poll of property owners to make sure the noise walls were something the neighborhood really wanted. The neighbors overwhelmingly said yes, and we went back to them to get their input about how the walls would look, where and how tall they would be, and ways that we could even save more trees during construction. Now we want to say thanks for the help and the patience and we hope things are a little quieter from now on. We’ve invited residents that live near the brand new noise walls to join us this Saturday, April 18, to commemorate the improvement to the neighborhood. 10 a.m., Saturday, April 18. Dead end of Latona Avenue N.E. just north of N.E. 77th Street. Obviously, I am delighted with yesterday's news that preliminary NHTSA data indicates that traffic fatalities for 2008 have gone down 9%. Unfortunately, our crash and exposure data bases are not sufficient for anyone to ascertain why this has happened. It is certainly logical to "assume" that some of it was due to reductions in driving linked to the economy, especially when you consider that some of the riskiest drivers, such as teens, might be the first to be affected by high gas prices. However, it also makes sense that tougher laws such as primary seat belt requirements and Graduated Driving Licensing, both of which have been proven to work, played a role. It's also logical to assume that the concerted efforts to make cars and roads safer over the past decade contributed as well. Nonetheless, I must ask, "Why haven't we invested enough in our data systems so that we could resolve this issue more easily?" I'm not sure of the answer but we must recognize the ambiguity in this area and understand how multiple factors can contribute to these statistics. And, finally, let us all not forget, even with nearly 3,750 fewer deaths this year, we still have a long way to go because 37,313 people still died and that is unacceptable. 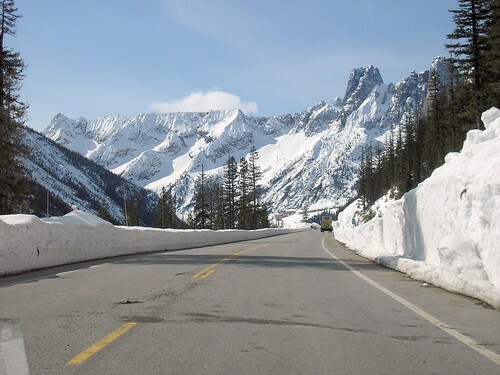 You know it’s spring when we start clearing State Route 20, the North Cascades Highway. Even though it’s not as warm right now as it usually is in the spring, the pass clearing is at least a telltale sign that spring is making a comeback. 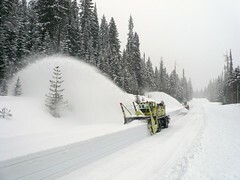 Crews started clearing the North Cascades Highway on Monday, March 30. It’s not shorts weather just yet, at least not for me, and not for the crews clearing the passes. When I was up there on Wednesday, April 1, it was 25 degrees and snowed all day. Brrrr! I had two coats and my stocking hat on to try and stay warm. Crews working from the west side of the passes had reached the Easy Pass trailhead, near mile marker 151.5. The snow walls left behind from the snowblowers were about 5 feet tall. While we’ve moved quickly from the west closure gate (at mile marker 134) to the Easy Pass trailhead, the snow will get deeper and it will take longer to move through as crews work their way east. We have quite a few more miles and several more weeks of work left before we finish clearing the passes. It would be nice if the temperatures warmed up and the snow stopped falling. If this current weather pattern keeps up, we might have to wait another week or two before we get help from additional equipment. We usually bring in extra snow equipment from US 2 Stevens Pass, but it’s hard to recruit their help when they’re still busy fighting snow. The local wildlife like to follow our progress, too. 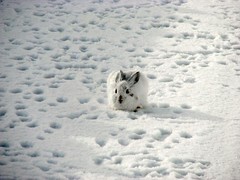 So far, the most popular picture from the pass-clearing work this year is a snowshoe hare (rabbit) checking out our crews at work.